Conservis Planning & Budgeting helps you create operating and financial plans based on accurate numbers, then use those plans to align resources and drive your business forward. Spot issues quickly, reconcile your actuals against budgets, and deal more confidently with bankers and investors. "Visibility is unbelievable – everybody knowing where things are at, what fields we’re on, what fields have been completed. It’s a great bit of information." 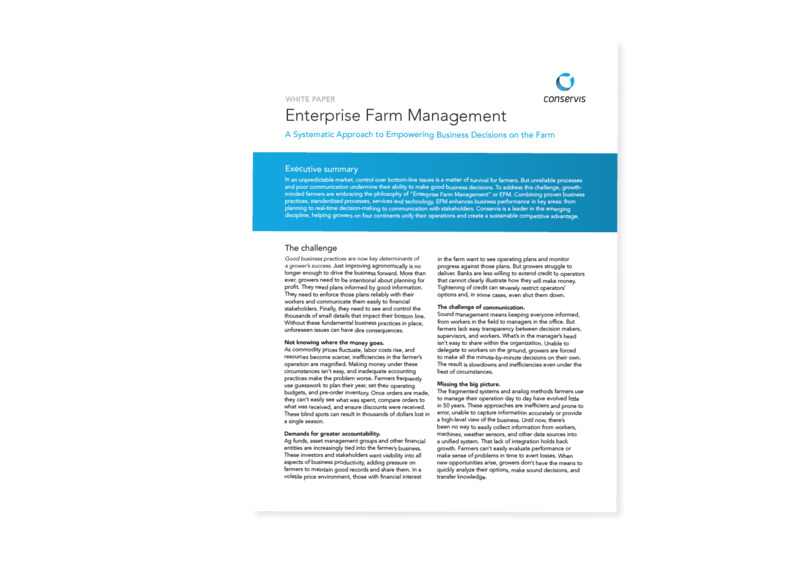 Download Report: "Take Control of Your Operation"
Combining proven business practices, standardized processes, services and technology, enterprise farm management enhances business performance in key areas: from planning to real-time decision-making to communication with stakeholders. We have one goal: successful farmers. We don’t care who you buy your seed or equipment from; we’re just here to make your farm the best it can be. That’s why we put your data to work for you-- and only you.